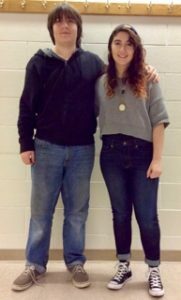 Steller Students, Isabelle “Bella” Libbrecht on flute and Sebastien Libbrecht on trumpet, have been accepted to the 2017 National Association for Music Education (NAfME) Northwest Division Honor Band. It is an honor group for the high school students in the Pacific Northwest Region. “The auditions were very selective. Bella and Sebastien competed against the most talented students not only from Alaska but also from the states like Washington and Oregon,” said Mr. Toba, the band director. “The audition results for Bella and Sebastien are the true reflection of their commitment to excel in instrumental music. Bella and Sebastien will proudly represent the entire Steller Community. I am so proud of Bella and Sebastien.” The All-Northwest Band will rehearse in Bellevue, WA, from February 17 through 19, 2017. All-Northwest Instrumental Concert will be in Benaroya Hall, Seattle, WA, on February 19, 2017. Also, don’t forget the All State Band and Orchestra will have a gala concert on Saturday, November 18 in the West High School Auditorium, at 6 p.m. Admission will be 10 dollars for adults, 5 dollars for students. Public is invited.